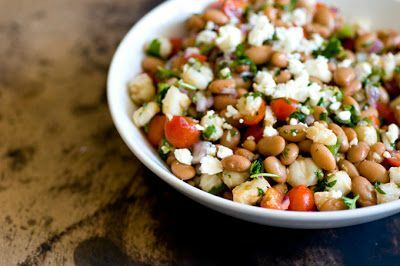 In a large bowl, add the pinto beans, hominy, red onion, garlic, tomatoes, cilantro, red bell pepper, and jalapeño. Toss until well combined. Whisk together the lime juice, olive oil, cumin, and smoked paprika. Pour over the beans and stir until evenly distributed. Stir in the Cotija or feta cheese. Add salt to taste. While you can serve it immediately, it tastes better if covered and chilled for at least an hour.